How Many Hikers Carry the 10 Essentials? In New Hampshire’s White Mountains, Shockingly Few. A new study out in the Journal of Wilderness and Environmental Medicine found that a mere 18 percent of hikers carry all 10 essentials—and that two of the most commonly forgotten items are perhaps the most crucial in a survival situation. 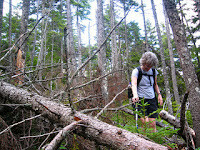 The study surveyed 199 hikers in summer 2011 at three White Mountain National Forest trailheads (Old Bridle/Falling Waters, Appalachia, and Zealand Falls) to determine whether they were carrying the 10 essentials enumerated by the HikeSafe program: map, compass, extra clothes, rain gear, fire starter, light, extra food and water, a knife, a first aid kit, and a whistle. Only 35 (17.8%) of the surveyed hikers reported carrying all 10 essentials. 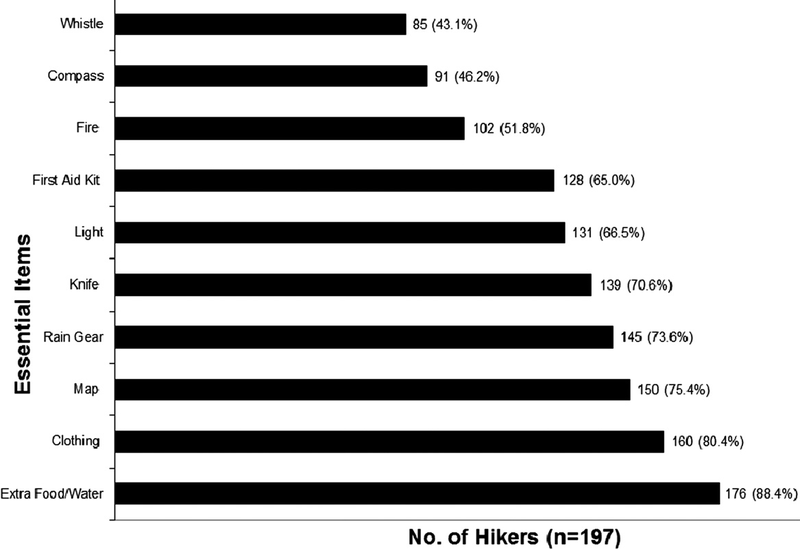 Less than half of the surveyed hikers (80 hikers, 40.6%) carried at least seven of the 10 essentials; the study identifies hikers in this category as prepared. 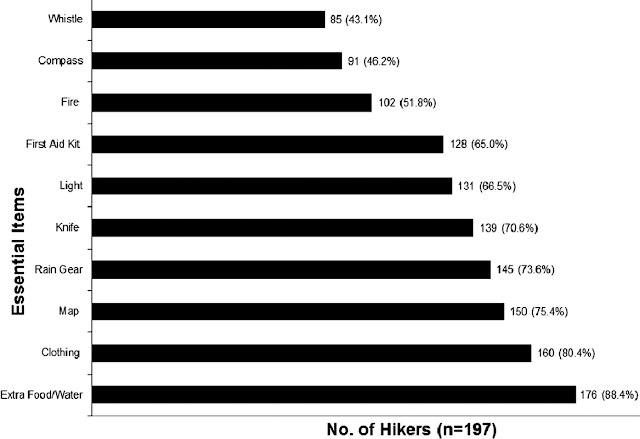 Younger hikers (age 20-29) were least likely to be prepared—only 29.8% of them carried seven or more of the 10 essentials. The odds of being prepared went up with age: 46.5% of hikers age 30-39 were prepared, 48.4% of hikers age 40-49, and 56.9% of hikers age 50-59. In general, I almost always hike with the 10 essentials—and strongly recommend you to do the same. But if I were forced to choose only a few items from the list to maximize my odds of survival in the event that I’m caught out after dark due to injury or unexpected delays, I would choose several of the items that were most commonly forgotten. As I’ve detailed before in Survive or Die: The Difference May Be Only a Few Ounces of Essential Gear, those items would definitely be: fire starter, whistle, and heavy-duty trash bags, plus a headlamp to help find my way if I’m caught out after dark. With just those basics (and the knowledge of how to use them), you could 1) survive an unexpected night out if injury immobilizes you (fire for warmth, garbage bags for emergency rain gear and clothing) and 2) readily alert rescuers to your location (whistle).